It is useless for Russia to continue denying that its military is not playing an active role in the Ukrainian conflict. Russian military equipment and soldiers are on the ground in the eastern Ukraine. Earlier in the week, Ukraine’s National Security Council released a statement indicating that Russian military forces have been seen in Donetsk, Luhansk, and other rebel controlled areas in the east. 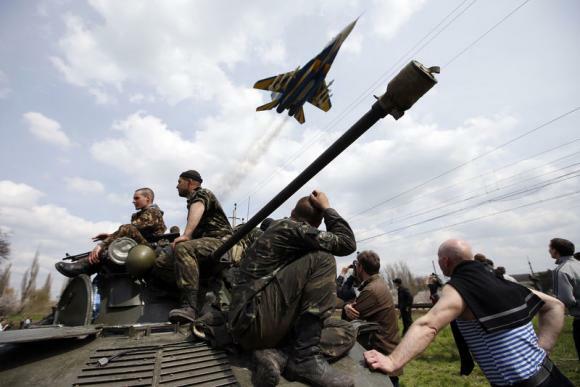 Kiev has complained to anyone listening that its military now has to fight the Russians as well as rebels. This statement is true and false. Granted, Russian combat units are not directly engaging Ukrainian forces, they are taking part in the fighting to an extent. Rebel leaders have ‘confirmed’ that Russian soldiers on leave make up the over 4,000 strong contingent of Russian citizens fighting in the Ukraine. Over the past week, rebel forces have seen a reversal of their fortunes with the addition of Russian equipment, and presumably, soldiers and advisers to their ranks. The opening of a second front along the Sea of Azov coast has diverted Ukrainian assets and attention away from what had been the main area of focus farther north. Until a week ago, Ukrainian forces had been recapturing towns and areas that had been under rebel control for months. Offensive operations have now been halted because of much stiffer resistance and an urgent need for friendly units along the coast. The pro-Moscow rebel victories have changed the face of the diplomatic game as well. A new peace plan is on the table, one that was put forward by Russian President Vladimir Putin. Two weeks ago such a move would have been impossible. However, with the separatists regaining the initiative, due in great part to Russian military assistance, Putin is ready to negotiate, and to do so from a position of strength. There are indications that a cease fire between Ukrainian and rebel forces could come as early as Friday. From the beginning of this crisis, Putin’s goal has been to partition the Ukraine. If a ceasefire takes place and the peace plan eventually becomes a reality, Putin wins. The Ukraine’s choices are simply not palatable. Kiev can either continue fighting a bloody, expensive war in the east against an enemy that is increasingly well supplied by Moscow, or it can quietly agree to the terms of a Moscow supported peace plan.